I can’t wait to share this darling witch costume with you. 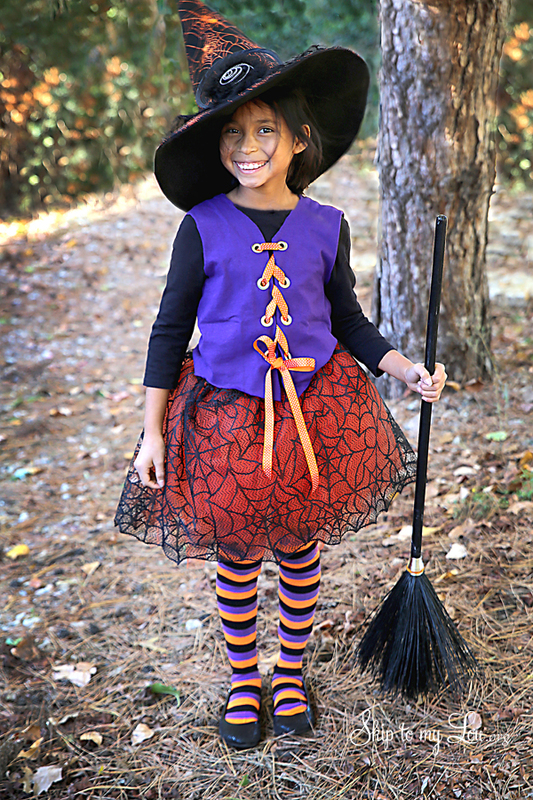 Just a few supplies and a couple pre-made items and you can have the cutest witch on the block. We love dressing up for Halloween at our house. We especially love good family costumes. Be sure to check out our favorite costumes. Can you believe I got my family to dress up as KISS? You might also like these costumes for babies. 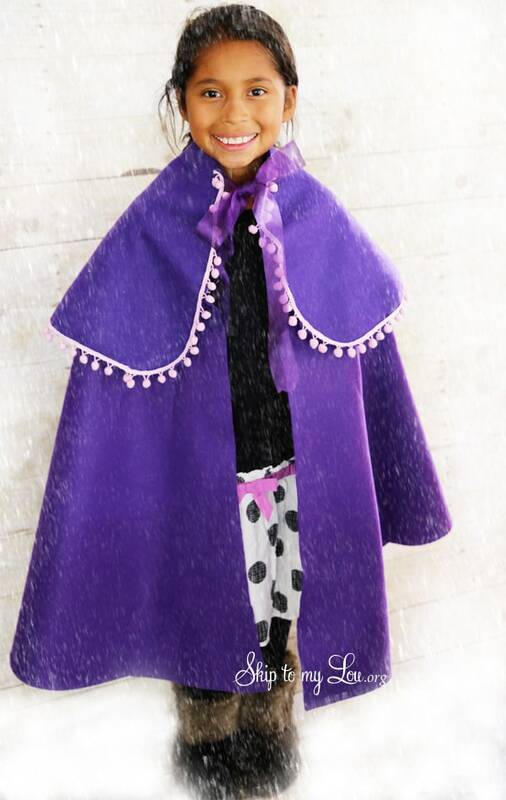 This year Bella wanted to be a witch and I came up with this easy no sew witch costume. So a witch it is! This costume was simple to make and could easily be made in an evening. I think the striped tights really make this outfit. 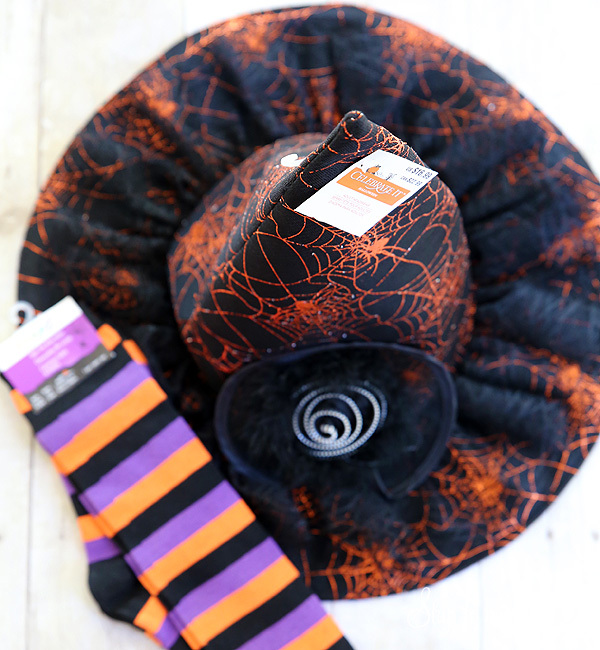 Find all the extras (hat, broom, socks in the Halloween section in most any store. A unique witch hat is a good investment because you will end up using it year after year. Everyone needs a last minute costume up their sleeves. To make this costume purchase a witch hat, socks, and a broom. My daughter loved picking them out. 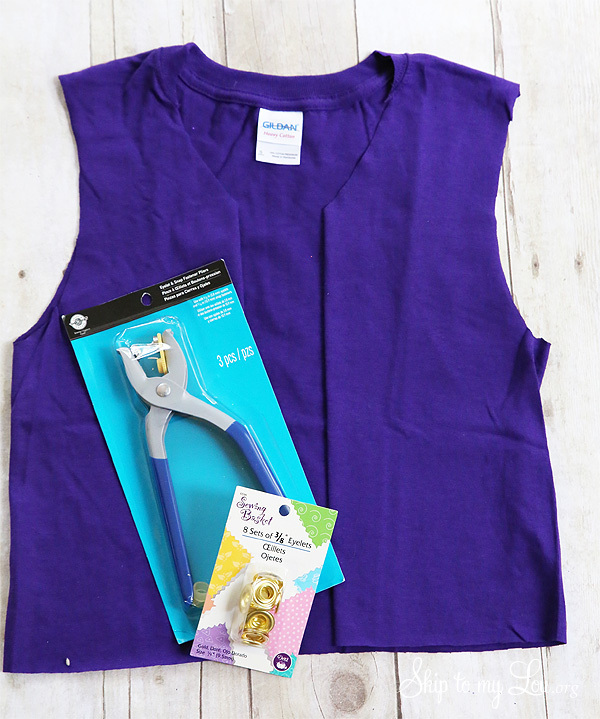 Complement these items with a t-shirt turned into a vest embellished with eyelets and ribbon. 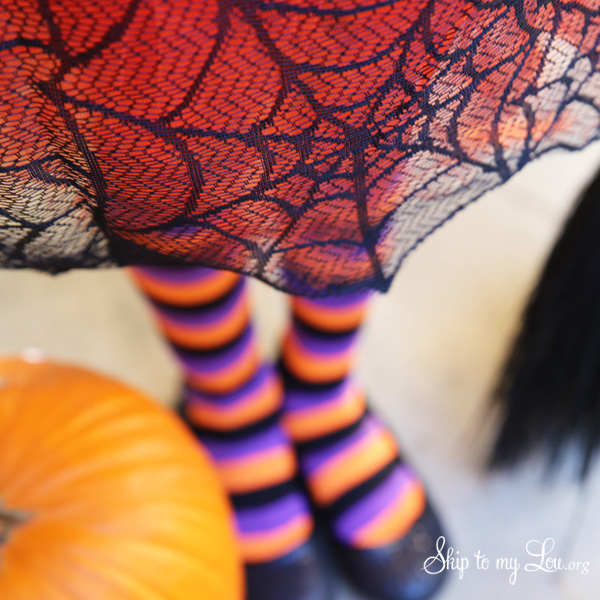 Spools of tule and a Halloween table runner make the spooky skirt. 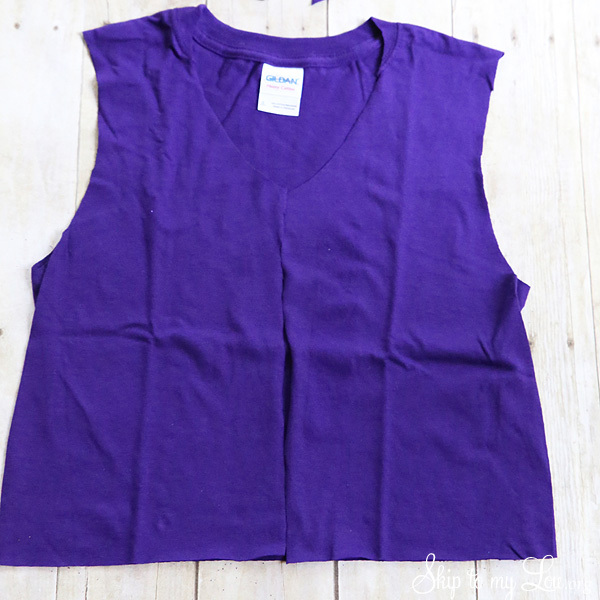 First, start by making a vest from a t-shirt. 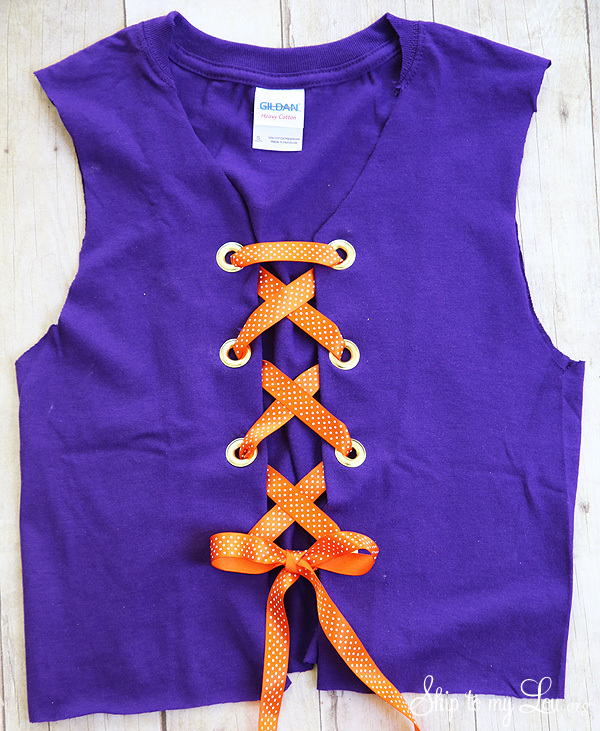 This ribbon and grommet enhanced t-shirt give the witch that perfect whimsical touch…… and it is no sew! 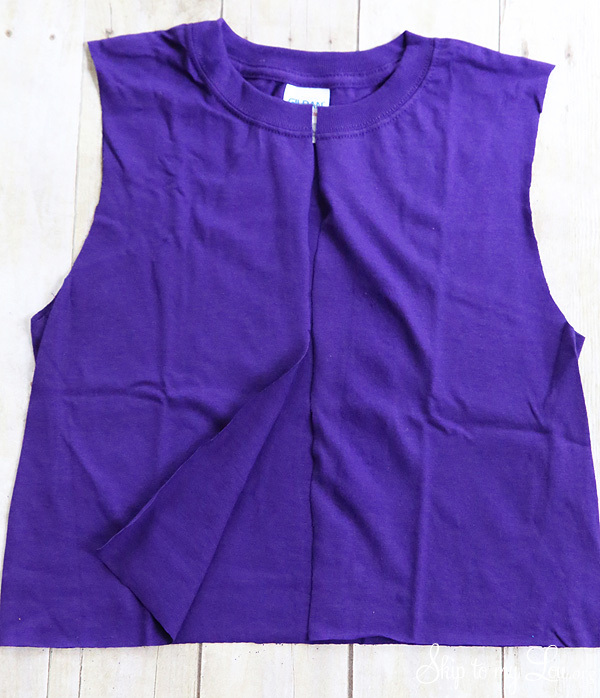 Cut off sleeves and shorten the shirt if necessary. 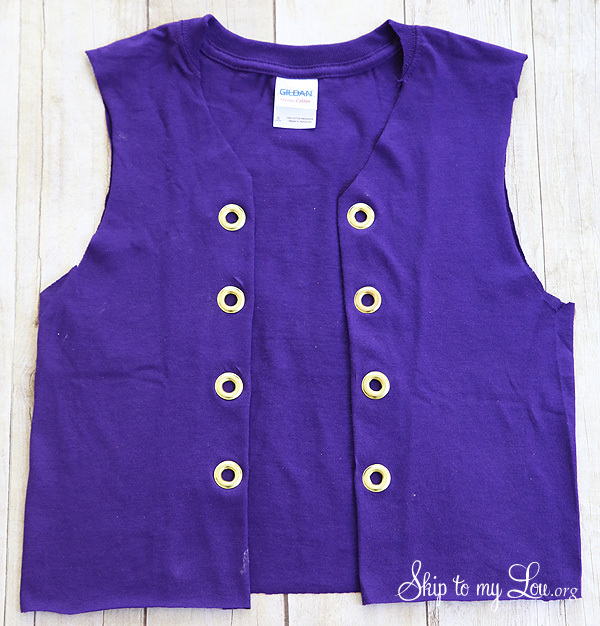 Leave extra length to trim points in the front of the vest at the end. 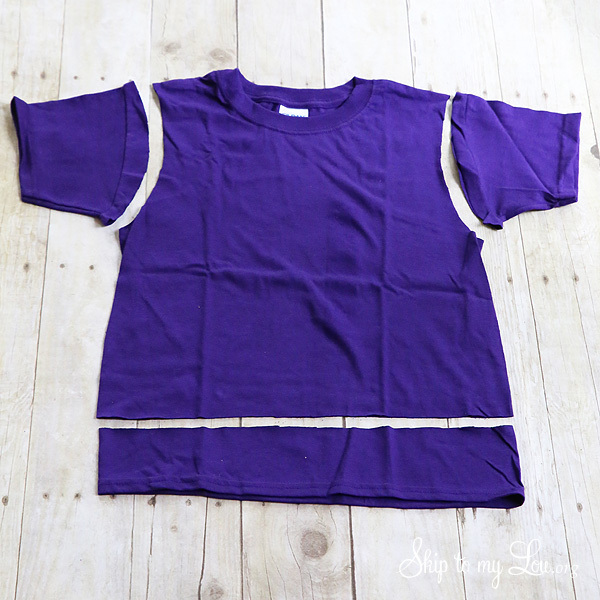 Cut a slit up the front of the shirt. Cut each side of the neck at an angle. Grab an eyelet tool and 8 sets of eyelets. 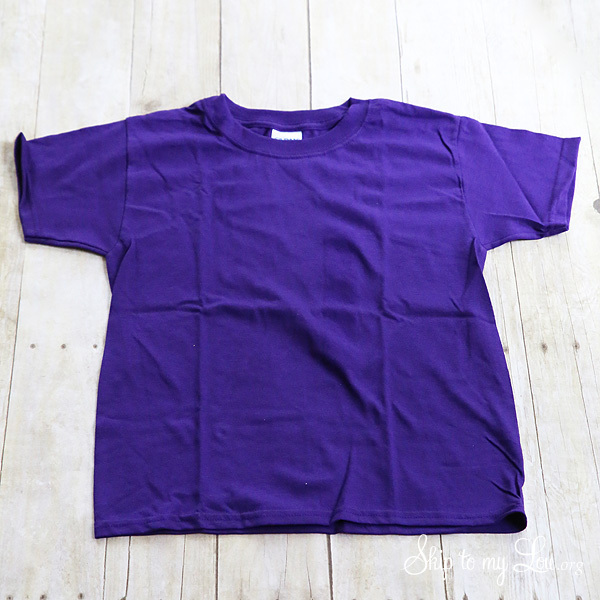 Fold each side of the front of the shirt under about an 1 1/2″. Evenly space grommets down each side. Lace it up with some cute ribbon. The skirt for this costume starts with a DIY tulle tutu and is topped with a lacy spider web table runner. Our witch needed a fancy skirt so we used this tutorial on how to make a tutu. However, in that tutu tutorial, I purchased tulle off the bolt from a fabric store. Now having made the tutus both ways, I think the tulle off the bolt makes a more durable tutu. Both methods do work. 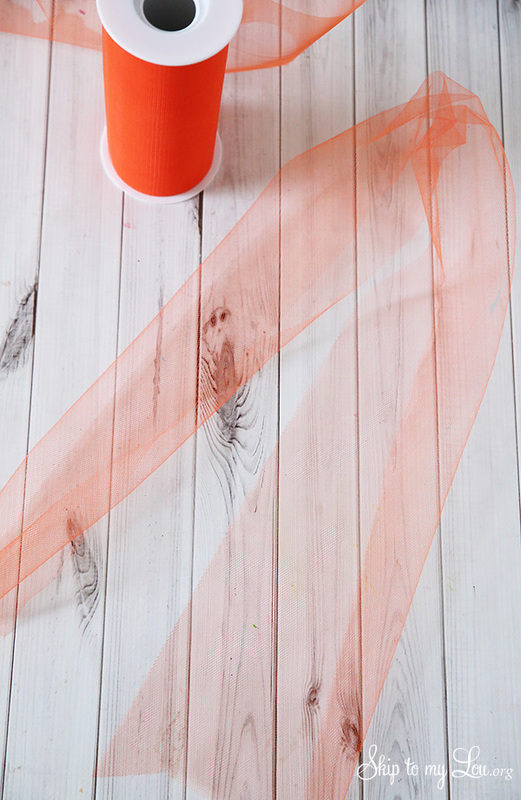 We made our tutu a bit more fancy by attaching a spiderweb table runner over the orange tutu. 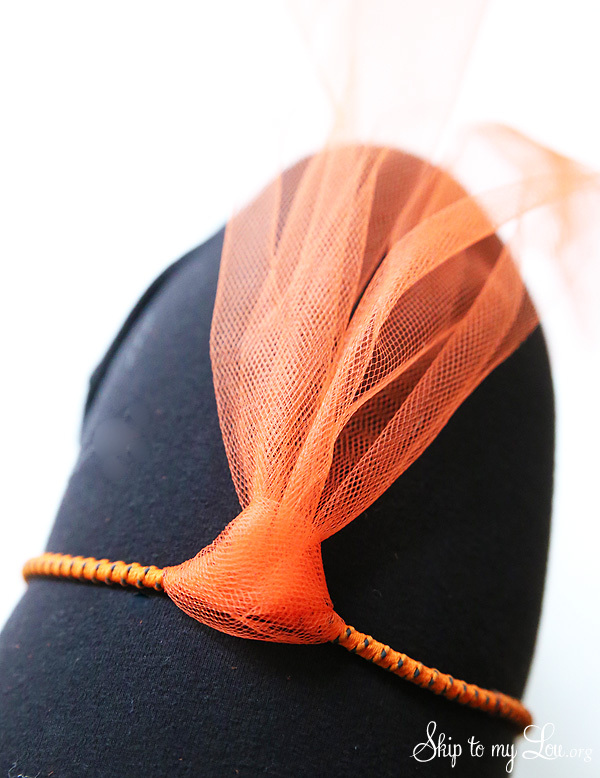 Start with tulle and an elastic headband or piece of elastic. I used two rolls of tulle but could have easily added more. 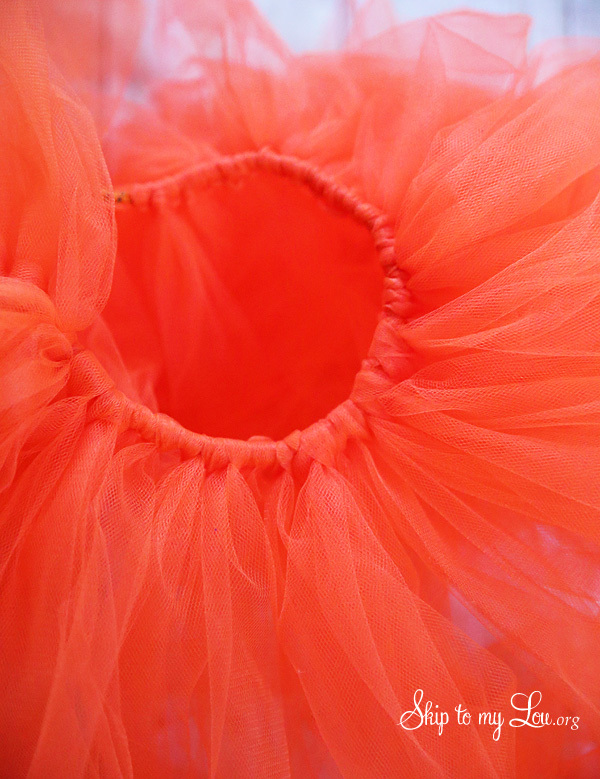 Decide how long the tutu is to be, add a few extra inches for the knot and double this amount. Cut lengths of tulle. 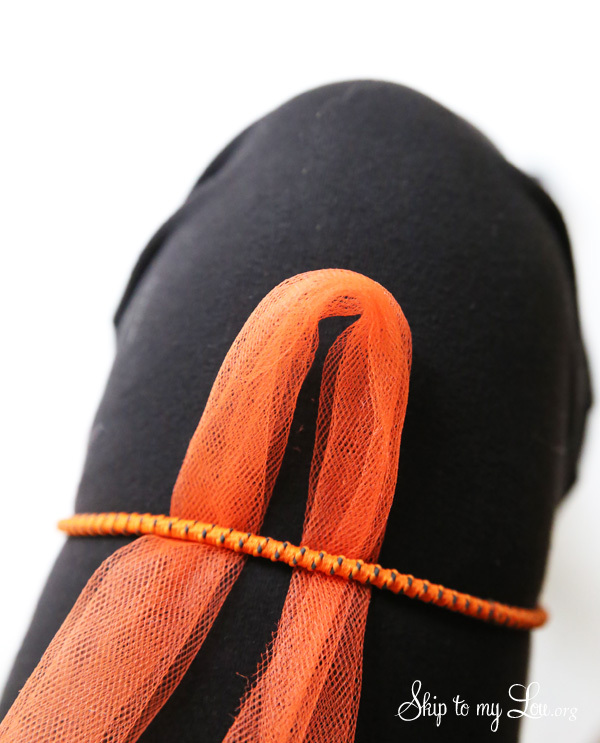 Place elastic headband around your thigh. 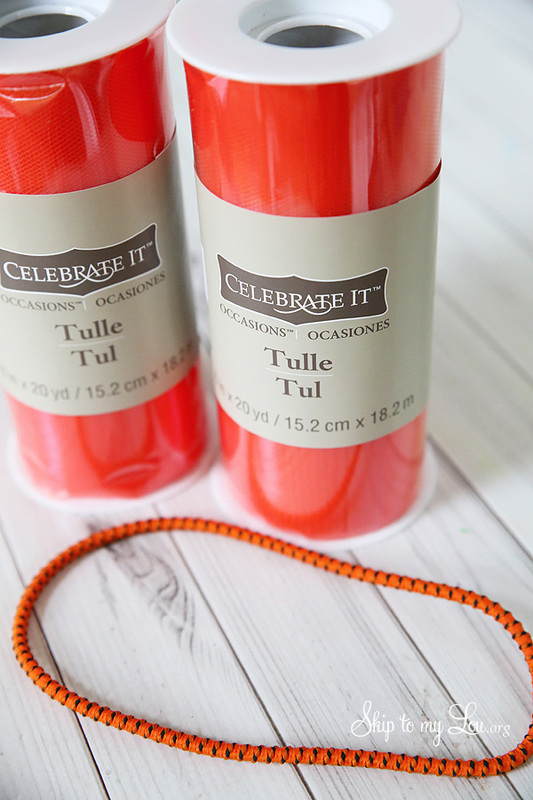 Fold the length of tulle in half and place under the elastic headband. Pull the tails of the tulle through the loop. Continue all the way around the elastic headband. 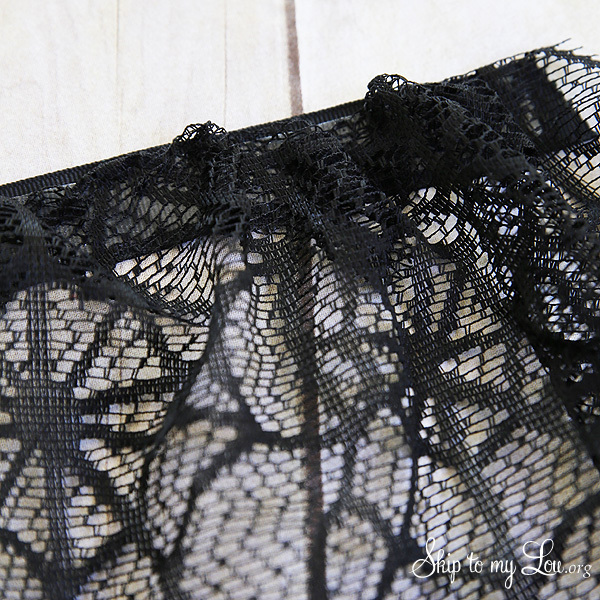 This tulle tutu is great as is or embellish it with a lace spiderweb table runner. 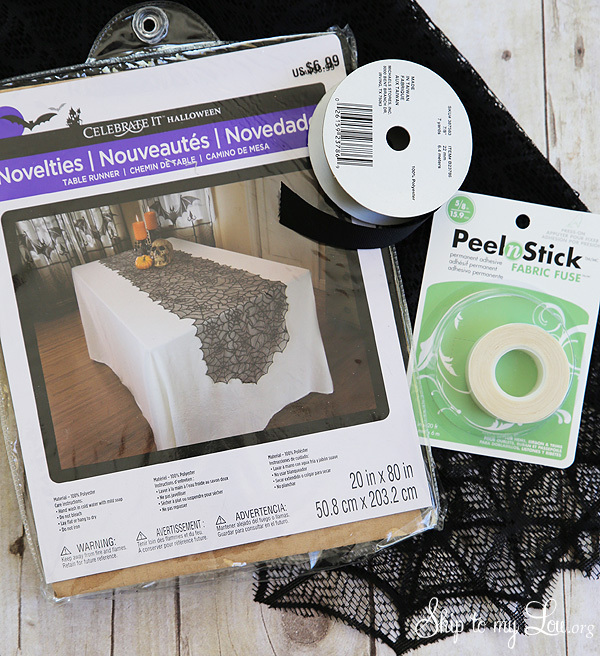 All you need is a table runner, black ribbon and Peel-n-Stick Fabric Fuse. Measure waist and add a few inches for tying. Place Peel-n-Stick on back of the ribbon. (leave a few inches free of tape for tying or securing with no-sew velcro. You will love this product. Remove paper backing from Peel-n-Stick. Gather table runner along sticky ribbon securing table runner to the ribbon. Place lace spider web skirt over tulle tutu. This frozen cape turned out really great. In fact, we did it about 30 mins before a party. You won’t believe that it is also a no sew project. You can change the color for your cape to make this work well with a lot of different Halloween costume ideas. 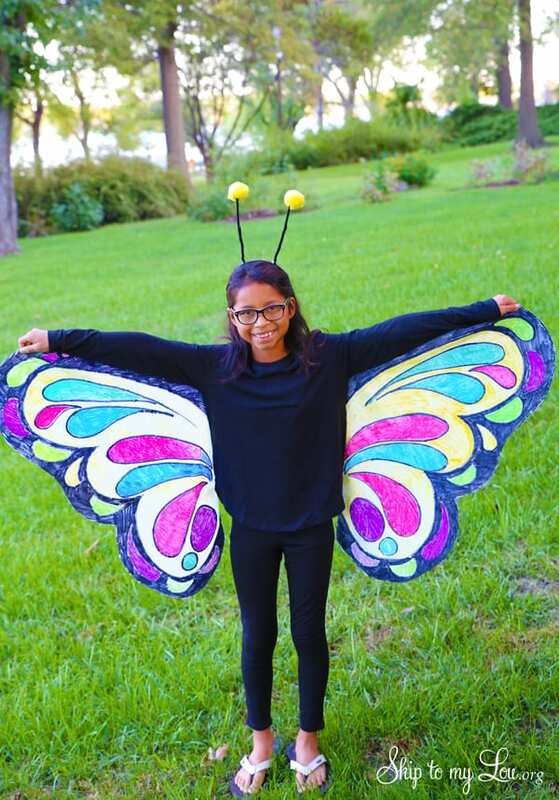 This butterfly costume is really bright and fun. You can make it in an afternoon with very few supplies! A little chef costume would be adorable. 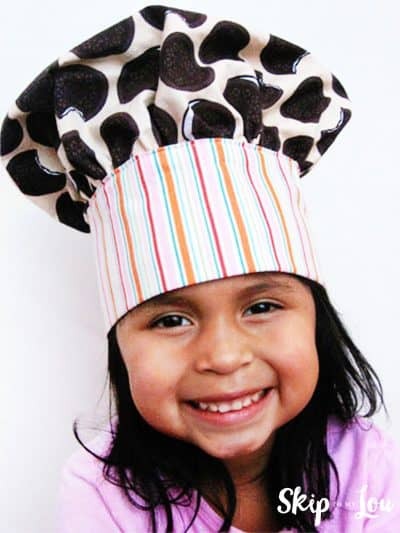 Whip up a child’s chef hat with this easy tutorial. 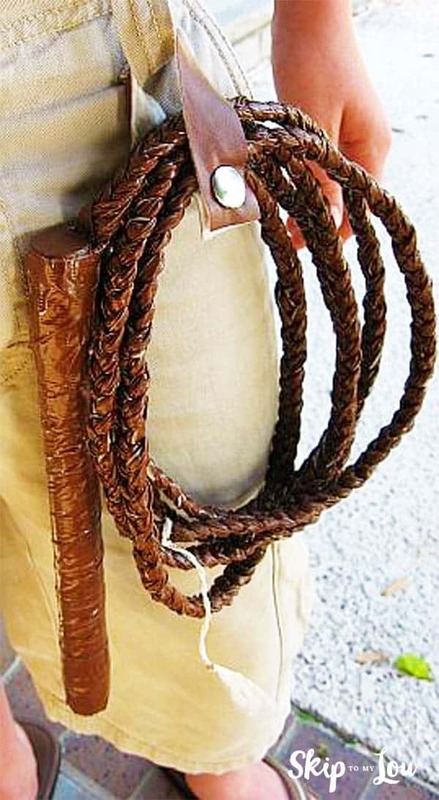 This duct tape bullwhip is the perfect addition to an Indiana Jones costume. Love the witch costume and that has to be the cutest witch ever!! That is one great tutorial too! Thanks for another amazing idea! I love how this costume turned out! Love the vest! Pinned! This costume is so cute!!! Did you buy the striped tights at Michaels also? I love them and want to get them!! !